Our Zachary Broncos will travel to Hahnville High School and take on the Hahnville Tigers this Friday night in the second round of the Football State Championship. Pre-sale tickets will go on sale Tuesday afternoon at the High School front office, Academic/Athletic Center and Rouses Food Market. Tickets will be $9.00 for Adults & Students. There is a charter fan bus leaving the Zachary High Gym parking lot at 4:00pm. If you would like to sign up please call the following numbers: 225-654-9764 or 225-654-7188. The cost is $25 and the deadline is tonight by 7:00pm to sign up. 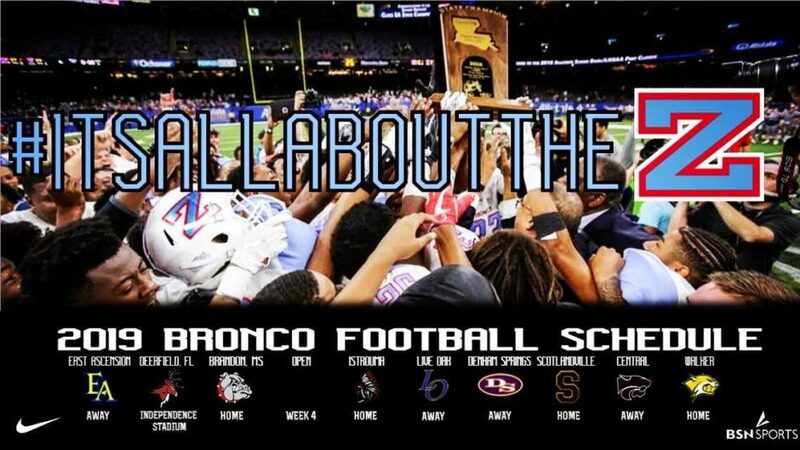 Hope to see all of you in Hahnville and cheer on our BRONCOS!